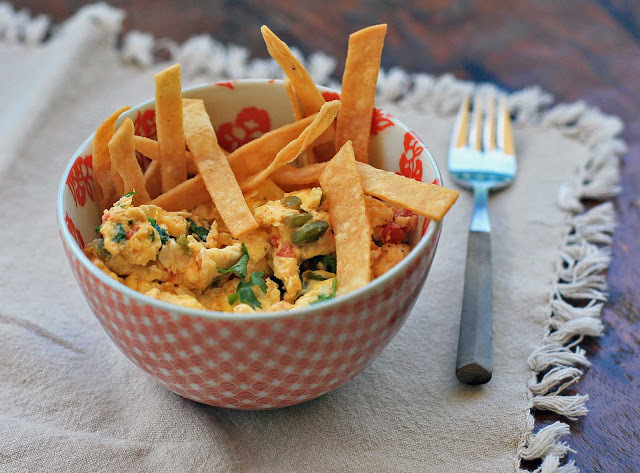 I just want to note the irony that the only place I think I’ve ever heard of adding heavy cream to an egg scramble came from a healthy-themed Mexican cookbook… and let’s not forget the deep fried tortilla strips. Oh, but the calories are worth it. And I was also pleased with how easy and how good the tortilla strips are. They’d be a really great substitute for won ton strips. Cut the tortillas into long thin strips. Pour oil in a small saucepan to a depth of about 3/4-inch and heat to 350 degrees. Add half of the strips and fry until golden and crispy. Remove and drain on a paper towel-lined plate. Repeat with the remaining tortilla strips. 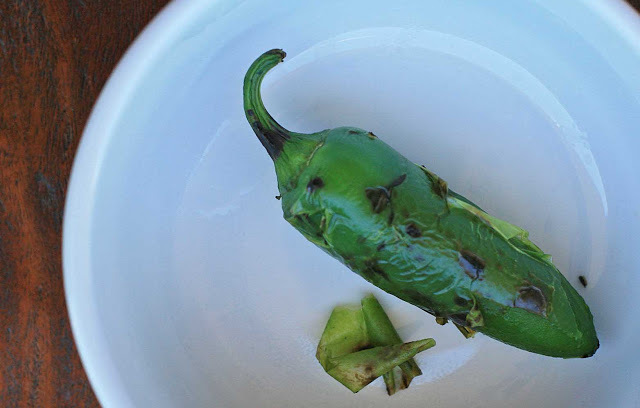 Dry-fry the jalapeno in a skillet over medium-high heat until scorched on all sides. Alternatively you can roast over the flame of a gas burner. Put in a small bowl and cover so that the heat doesn’t escape. When cool enough to handle, peel off the skin and discard. Then remove the stem, seed and finely chop. Set aside. Heat about a tablespoon of oil a large skillet over medium high heat and add the garlic. Cook until fragrant and then add the tomato and jalapeno. Cook, stirring occasionally, for another three to four minutes. Add the eggs and stir when they begin to set. When the eggs are about halfway through cooking, pour in the heavy cream and stir gently. Add the cilantro and stir again. When the eggs are cooked through add salt and pepper to taste. Serve with the fried tortilla strips.